The other day the tot got in my craft drawer and found some wire. Before I knew it she was all wrapped up – and giggling like crazy! Instead of getting upset or frustrated with her fun exploration, I figured it would be a great opportunity for creating something awesome! An Alexander Calder balanced mobile! What’s great about Calder is he made these small and uber-large sculptures that moved (yes, a mobile) that were kinetic. This means the environment interacted with his creations, helping them to move and float. I love Calder’s mobiles and actually had the chance to see some up-close and personal in a vault located in a museum I used to work for. And, let me tell you, that was all kinds of awesomeness. So, Calder has a special place in my heart, and I wanted to share his cool art with my daughter. After I un-wire-wrapped her, we took a look at his mobiles and she loved pointing out the colors she found. Then, we got to work! All you need to do this art activity with your child are two different gauges of craft wire (I used 28 and 20), scraps of paper, and some patience! You and your child can take another look at Calder’s work and how he used shapes and line to create exciting, balanced, kinetic creations. Craft wire is a fun, but feisty, thing. It can be sharp when cut, so this project is geared for the older set, let’s say 3rd grade and up. You could do the project with younger kids using string and sticks, and it would still be cool! Invite your child to cut a length of the heavier gauge wire to use for the base for the mobile. Now she can search for interesting bits of paper to use for her cut-out shapes. I had some pieces of patterned paper that worked wonderfully. Encourage her to cut organic shapes, which means flowing un-edged shapes, to use for her mobile. Now she can use a hole punch to make holes in each of her shape and then string with the lighter gauged craft wire. Sometimes working with the lighter gauge craft wire can get a bit finicky. It’s thin and has a mind of its own, but encourage your child to keep at it finding where to twist the hanging shapes on the base wire to create a balanced mobile. My wee tot helped by threading the wire through the holes! If your child is feeling up for the challenge, she can even suspend an additional length of the heavier gauge craft wire along with more shapes hanging from it! 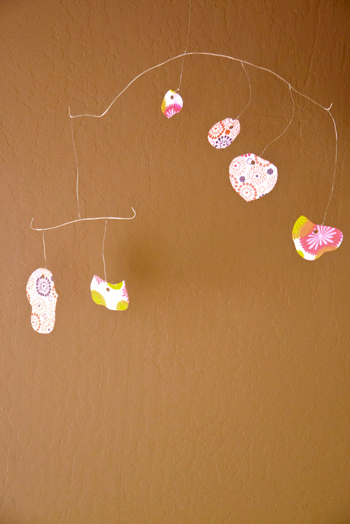 Help your child find the perfect place to hang her finished Calder inspired mobile where it can move and be admired! *What I learned while doing this project? I’m not as patient as I used to be with craft wire, probably because I had a wee tot that really wanted to use it, too (MINE! ), and taking a good picture of a mobile is really hard!